From the Editor: Gigi Newton is an early intervention specialist with the Texas Deafblind Project sponsored by the Texas School for the Blind and Visually Impaired (TSBVI). During the 2012 NOPBC conference she conducted a workshop on Active Learning (AL), the intervention approach developed by Dr. Lilli Nielsen (1926-2013). She developed this article based on the presentation she gave at the NOPBC conference. You could say I'm a Lilli Nielsen groupie. Dr. Lilli Nielsen is the pioneer of the Active Learning approach. A native of Denmark, she researched and developed equipment to help children become active learners. She was the first educator ever to be knighted by the Queen of Denmark, based on her dedication to helping individuals with visual impairment and blindness. Lilli has been in the field of education for over forty-five years. Her research is based on her work with blind/visually-impaired children with and without other disabilities. You can read about her research in her book Space and Self. When I went to my first Lilli Nielsen conference twenty-two years ago, I didn't like Lilli at all. I had spent many years doing the wrong things for kids. As a teacher, I was taught to talk to kids, to teach them language by talking and talking. I was taught to use the hand-over-hand method, to take hold of a child's hands and help him or her manipulate objects. By making the child touch things, I thought I was desensitizing the child to things in the environment. Sometimes kids bit me or pinched me, and I didn't understand why that happened. I wasn't picking up the subtle hints kids gave me. When I grabbed their hands and they bit me, they were saying, "I don't like this!" That was communication! I was working in early childhood intervention programs, and we developed goals for each child. We had to come up with goals for gross motor and fine motor skills. I saw it as my job to make the kids do all of the things on my list. I forgot to sit back and watch the children. If I sit back and observe, they show me how they get information into their neurological systems so it can make sense to them. When I say that I didn't like Lilli, I really mean it! I couldn't stand her! She said everything I'd been taught in college was wrong. First of all, she said, "Be quiet. Stop talking to the kids!" I thought, Well, excuse me! How else am I going to put language into them? I was constantly running my mouth when I was with the kids. My daddy used to say I'd talk to a fencepost! But Lilli said children learn by experiencing things. That's what she was teaching us. Another thing Lilli told us was, "Never, ever touch a child's hands!" I'd been taught that when you want to show something to a blind child, you take the kid's hand and put it on the object. You want to show the child how to do something, you put the kid's hand through the motions. Lilli said that was all wrong. She said the child will explore on his own or her own, once we make the environment interesting enough. It was a five-day conference, and for the first three days I was very unhappy. Then I fell in love with Lilli. There were a hundred and twenty-five of us adults listening to her, and there was one little boy in the audience. None of us even noticed him. He sat in his wheelchair, not moving, not crying, not making a sound, for three days. Then Lilli looked over at him and said, "There is no reason for that child to be bored. Put him on the Resonance Board and give him a little break." She put him on the Resonance Board and continued to lecture. Pretty soon we heard giggling. We heard laughter. We heard toys clattering. This child, who had sat in a wheelchair without moving for three days, had become active. He was laughing! There's nothing better than hearing a child laugh! After that conference I realized I had been doing many, many things wrong. At the time I thought I was doing what was best. I have apologized to a lot of parents. When I began to use Lilli's Active Learning approach, I was afraid I would lose my job. If an administrator came to watch me, I would just be sitting there. It looked as though I wasn't doing anything. I'm not afraid to talk to administrators now. I can explain what I do and why I do it. What Is the Resonance Board? Teachers and caregivers tend to place children on soft surfaces such as blankets or rugs. However, a soft surface doesn't provide much information to a blind child. For instance, when the child drops a toy, there is no sound to indicate where it landed. It simply disappears. The Resonance Board is a thin, flexible sheet of wood that gives tactile and auditory feedback whenever the child moves. When the child kicks the board, there is a sound and a vibration. This feedback encourages the child to repeat the movement, and eventually to experiment with other movements as well. The child moves independently, without an adult manipulating his or her body. Sounds created by the child's movements resonate from the wood. This immediate feedback can help the brain integrate motor activity and listening skills. I've gotten some very odd looks from physical therapists! I remember one child I visited at home. He was lying on a rug, his legs scissored, his back so arched you could see underneath it. The physical therapist said, "You're not going to put him on that board, are you? It's got no padding!" Before the session was over, the child's extension had broken up. He had used his hands at midline, and he was bending his knees so that the soles of his feet rested on the board. That night the physical therapist called me. She said, "You need to know that in the three years I've seen him, this is the first time he has ever moved that way without adult intervention." She was a big believer in the Resonance Board after that! The Resonance Board can be used in a variety of ways. Here are some examples. 1. The child lies alone on the board with favorite items around her. 2. An adult sits with the child and offers favorite items. The adult is the child's playmate, not a teacher. The adult does not talk or do hand-over-hand with the child. 3. The child uses the board inside the Little Room. The adult is an observer. The adult notes what the child is doing and tries to determine which are the child's favorite items and activities. By collecting this data, the adult learns what interests the child; those items of interest can be used in other environments to support progress. What Is the Little Room? The Little Room is an environment that allows the child to play and explore without distraction or interference. Lilli Nielsen developed her idea of the Little Room based on what she calls the "denning effect." She observed that children up to the developmental age of eleven seek out and enjoy dens, or small, enclosed spaces. As she states in Space and Self, the first room for human beings is in mommy's uterus. 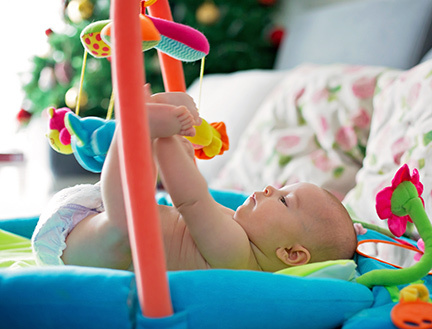 As a child grows, the possible denning areas can include the corner of the crib, a kitchen cupboard, the space under a table, the corner behind a chair or couch, or a tent created by draping a blanket over pieces of furniture. I am well over the developmental age of eleven, and I have always been a denner. My current den is a nice, warm bath in the tub. It provides comfort and joy for me. It allows me to enter a calm, peaceful emotional state. If the child with vision loss can't yet get to or make her own den, the space must come to her. This is the idea behind the Little Room. Dr. Nielsen spent three years researching and testing the Little Room's size and design. It is essential for the child to be able to touch the walls. This is a critical difference between the Little Room and commercially available, open-air, standing activity frames. Adequate ventilation is also crucial. There must be enough oxygen supply that the child can be active and will not fall asleep. The need for proper ventilation is one of the reasons cardboard boxes should not be used. The items in the Little Room, made of materials such as wood, metal, and fabric, are suspended from the walls with elastic cords. They are within easy reach, and the child can comfortably examine and play with them. When the child releases an item, it returns to its original location. Therefore, the child can locate the item again and repeat the activity. This repetition builds memory for the child. If the child needs time to process what he has done, no adult is hovering over him to interfere. We all know how important it is to have unbroken concentration when we're learning something new. If someone breaks our train of thought, we may not be able to pick up where we left off. We may have to start all over again to learn the new information. When an adult shakes a rattle or other sound toy for the blind child, the child is just hearing a random sound. The sound has no true meaning, and no learning can occur. The child cannot associate the sound with that particular toy. However, when the child can make a sound with an object, he gains an understanding of causation and a sense of mastery. He will repeat the sound and learn that his movement made the sound occur. Then he can start to compare that sound with other sounds. Who Can Benefit from Active Learning? Lilli Nielsen developed Active Learning as a way to work with blind and deafblind children who are functioning at a developmental age of four years or younger. The approach also has been effective with blind and visually impaired children who have additional disabilities such as autism or cerebral palsy. To benefit from this approach, the child should have access to Active Learning equipment such as the Little Room and the Resonance Board on a daily basis. Lilli has used Active Learning with people all across the chronological age spectrum, from infants and toddlers to adults fifty years old. I have used the Resonance Board and the Little Room with infants and children and even with a twenty-one-year-old. The individuals had various degrees of functional vision, hearing, and motor skills. Active Learning equipment can help a child regulate his bio-behavioral states. One mother described her son's first experience with the Resonance Board and Little Room. For the first time in over a year after a serious illness, he was able to calm himself without her physical intervention. When she placed him in the Little Room, he fussed and started to cry. As he flailed his arms, he accidentally hit an object, and he became curious about it. He started to interact with the object, and through this activity began the process of calming himself down. The activity was repeated over and over again for at least forty-five minutes. The mother cried with joy. I have seen many exciting, amazing things happen for children through Active Learning. I have seen many parents shed tears when their children did things in the Little Room that they had not been able to do before. The children were having fun, and learning was taking place. Teachers of the visually impaired report that children with cortical visual impairment (CVI) appear to start using their functional vision in the Little Room, and use of their visual skills continued outside this environment. I must caution that, without care, mistakes can be made. The Little Room must be set up with attention to the interests of the individual child. If the Little Room is set up with objects that are not interesting to the child or objects that are incorrectly placed, adults may conclude that the child did not like the experience. The Active Learning approach has taught me to wait and observe the child. The child will tell me what she needs in order to learn new information. It is my job to set up the environment so she can get what she needs. Lilli Nielsen believes that every child can learn, and every child has the right to learn. LilliWorks Active Learning Foundation is the only authorized North American distributor of Active Learning equipment. LilliWorks also supplies Dr. Nielsen's books and her videos on DVD. The foundation's mission is to advance Active Learning through supply of equipment, education, and research. LilliWorks is dedicated to the Active Learning principle that "everyone can learn." This website is a community for parents and teachers who are interested in implementing the Active Learning approach. It is sponsored collaboratively by the Penrickton Center for Blind Children, Perkins School for the Blind, and the Texas School for the Blind and Visually Impaired.